That he think of a hero without feeling fear? The volume of space through which the colonies are strewn is governed by the Empire, a sort of interstellar government. Its name suggests suzerainty over the colonies, perhaps established by conquest, but in fact the colonies aren't really part of it at all. With very limited exceptions, the Empire rules only in space. Each world is ruled independently by its sovereign colony or colonies, and the colonies maintain relations with the Empire that are essentially diplomatic in character. The Empire might be thought of as a combination of the United Nations, a powerful megacorporation with a lucrative monopoly on interstellar travel, the estate of an inventor with a guilty conscience, and an enormous interstellar aid charity. The Empire effectively rules space in a sphere 350 light-years across, centred on the place where Earth used to be. This is a tiny, tiny fraction of the Galaxy, which is 100,000 light-years across. It doesn't even come close to stretching the full 2,000-light-year thickness of the Galactic disk, and contains only about thirty thousand of the Galaxy's 300 billion stars. It is one ten-millionth of the Galaxy. There is very probably something out there, but the Empire is not aware of any human settlements beyond its authority, and is not in contact with any starfaring alien civilisation. Exploration goes on continuously, but there are no frontiers and no external relations. The Empire's roots are in the Eichberger Foundation, a vastly wealthy non-government organisation that was founded by the inventor of practical faster-that-light travel. Dedicated to abating and repairing the damage done by FTL transportation, the Eichberger Foundation attempted to control the use of FTL drives. That drew it into conflict with the prosperous colonies that wished to use Eichberger drives freely and for their own advantage. Wars ensued, lasted for decades, and were ruinous. The Empire was founded to settle them, as a diplomatic compromise. The founders' intentions were that the Empire should consist of a meritocratic bureaucracy that was supervised by and dependent upon the Imperial Senate, which should be appointed by the governments of the several colonies. But it didn't work out that way. Owing to the intransigence of the early Senate and financial support from the Eichberger Foundation the Empire developed an unintended independence. The Senate remains the only source of any authority the Empire can have to intervene in the affairs of colonies, but it has no control of the Imperial budget, no control of appointments, and no authority to command Imperial officials. The inaugural staff of the Empire, the personnel of its space navy and so forth, were the people who had served and fought for the Eichberger Foundation through the Formation Wars. Most of them were survivors of the destruction of Mayflower by a catalytic thermonuclear bomb in 431 PDT, or had were raised by such survivors during sixty years of the Formation Wars. They established a culture for the Imperial Service and its residential habitats that was based in the culture of Mayflower and deeply transformed by two generations of life in space in wartime. This culture has tended to assimilate recruits from the colonies over the last 111 years, has developed a unique character, and is now established as the culture of Imperial Direct Jurisdiction. The ideal limit of Imperial jurisdiction is that every colony is sovereign within 100km of its world's surface and the Empire is sovereign everywhere else. In practice this distinction is beset with exceptions. The Empire must allow worlds that have space industries to exploit to their own systems for peaceful purposes. It finds it most convenient to grant charters of self-government to outposts and orbital habitats not its own, retaining sovereignty and the right of inspection. The communities living there are self-governing under Imperial charter: not Imperial direct jurisdiction but not colonial jurisdiction either. Each colony must lease the Empire 200 square kilometres of land from which to conduct its diplomacy and in which, if it wishes, to operate a spaceport. The Empire has extraterritorial jurisdiction in these enclaves. The Senate has the power to make Imperial laws that apply within colonies' sovereign jurisdiction, but it is very sparing in doing so. In 499 PDT the Senate passed an Imperial Crimes Act regarding terrorism, mass murder, weapons of mass destruction, and various crimes with a nexus to the Empire and its operations and personnel. Decades later it set up an independent commission to investigate and prosecute such crimes and courts to try them. The Commission for Justice and the Imperial Courts are autonomous, but technically Imperial. In cases of blatant need, the Senate will pass an /ad hoc/ intervention act to authorise the Empire to intervene in the affairs of a particular colony, for a specified purpose, within a specified time, and using specified means. Each time New Worlds Realty opens up a planet or moon for immigration, the Senate must pass a specific act to let the Empire retain jurisdiction after the moment the first colonist arrives. Since 584 PDT these establishment acts have laid down specifics of the colony and government that must be established. Establishment acts always have a sunset clause: Imperial jurisdiction expires after fifty years, or upon the new colony achieving specified conditions. The Empire was founded to take over the task that the Eichberger Foundation had set for itself, which (after the destruction of Mayflower and Orinoco) was to prevent mass killings, with special responsibility for those connected with Eichberger drives, interstellar travel, or spaceships. Under the Treaty of Luna it has prerogative powers relating to Eichberger drives, FTL transport, interstellar travel, weapons of mass destruction, and any possibility of interstellar war. This is the Imperial Mission, and nearly all Imperial personnel are dedicated to it. The exceptions are fanatical about it. In order to discharge its mission the Empire needs revenue, so a lot of imperials are employed in Imperial Spaceways, New Worlds Realty, Eichberger Foundation shipyards, the Universal Bank, Universal Imports, the Universal Technical Consultative Service and so forth, making money. In order to preserve its ability to pursue its mission in the future, the Empire has to do things, even harsh things, to protect itself and its interests. Therefore, cynical people who are used to claims of high moral purpose being cloaks for self-aggrandisement and nest-feathering assume that the Empire is hypocritcal and that its personnel are venal. They are mistaken. Imperials whose jobs are not at the cutting edge of Imperial activity do not often have occasion for heroics of self-sacrifice and self-denial, but they are very hard to corrupt and sincerely believe themselves to be engaged every day in saving lives on an enormous scale. Imperial servants have their children raised using advanced developmental psychology to share their parents values. These children grow up to believe that mass killings and mass deaths of intelligent beings is the worst thing, and that a decent person will naturally exert himself to his utmost to prevent such deaths. And when they become adult, they make up half the recruits to the Imperial Service. The other half are recruited from the colonies, and they are selected using advanced psychology for similar values. Mostly unfamiliar with personal ambition, strong religious imperatives, clannishness, financial want, anxieties on behalf of their children, fear of penurious old age, and such motivations, Imperials tend to think that what they are doing is more important and more noble than what concerns outsiders. This tends to make them high-handed and uncompromising, with little sympathy for colonials' anxieties, fears, and faith, contempt for their ambition, possessiveness, and loyalty to kin, clan, or nation. Imperial servants, together with their children, their retired predecessors, and a minority of free-lance workers make up a separate society from the colonies. This society occupies those places where the Empire holds direct jurisdiction, which is to say in the Empire's orbital habitats and in the small extraterritorial "Imperial residences" that it governs, one in each colony. The population of IDJ is only about fifty million; thirty-four million of its people work for the Empire, and the conditions and experience of Imperial service pervade its culture. Secured against terrorist attack and occupied by a society with almost no criminals, IDJ is a place without crime, disease, or hunger. Its economic inequality is small, its social distinctions subtle, and its common sense of purpose pervasive and powerful. To colonists from almost any colony, the vast majority of mankind, IDJ would be a very alien place indeed, if they knew anything about it. The Empire's activities begin with the Eichberger Foundation, which has a monopoly on the manufacture of FTL drives, and which owns Imperial Spaceways, which has a monopoly on interstellar transportation and conducts all interstellar liner and tramp shipping. Monopoly of access to uninhabited worlds gives the Eichberger Foundation a monopoly on new real estate, which it conducts through New Worlds Realty and a development company for each new world. The Foundation conducts commerce on its own account through its subsidiary Universal Imports, and its universal scope gives natural advantages to its Universal Bank. These firms produce astronomical profits, which the Eichberger Foundation donates to the Empire. The Empire spends the great majority of its income on aid programs in backward and vulnerable colonies, aid programs that are designed to head off the mass deaths that threaten from famine, plague, chaos, and war. The Agricultural Assistance Service plans, directs, and finances the construction of vast irrigation and drainage schemes, transportation systems for agricultural inputs and products, and mines and factories for fertilisers. It also attempts to introduce new or improved crops and teach agricultural methods. The Ecological Service plans, directs, and finances schemes to eradicate pests, reclaim unterraformed land, rehabilitate degraded farmland, and improve climate — even adjusting worlds to increase their habitability on a global scale. The Public Health Service teaches hygiene and sanitation, researches diseases and parasites to develop cures, builds and finances teaching hospitals, sets up medical training systems. The Technology Transfer Assistance Service builds technical colleges and sets up training systems for engineers and technicians; it also supplies free technical and manufacturing specifications for everything on which the patent has expired. The Public Education Service sets up teacher-training systems, broadcasts educational programs from satellite, supplies educational content to colonial information networks, and sometimes supplies receivers and network connections to schools and communities. The Economic Advisory Service and the Social Engineering Advisory Service co-operate gingerly with colonies' governments to bring prosperity to the poor, stabilise economies against a tendency to produce famines, limit the exhaustion of natural resources and damage to the environment, and alter social features that produce or perpetuate poverty and violence. Dedicated Imperial servants to carry out these projects are scarce; they employ local workers, hire off-world experts on contract, and use expert systems running on computers as much as possible to do work not requiring the greatest honesty and dedication. Therefore you may well find a single Imperial servant, of quite low rank, in charge of an enormous program with a staggering budget. The Empire's Colonial Office works on the principles "one plague, one doctor", "one famine, one agronomist", "one continent, one hydrologist", and "one war, one diplomat". The activities the Empire takes within the view of rich populous colonies are actually less extensive, but contribute more to its public image. The Eichberger Foundation runs orbital shipyards and spaceports. The Imperial Navy inspects ships, orbital facilities, and outposts. It also keeps warships, weapons, and surveillance satellites in orbit for use against possible terrorists, to protect colonies against rebels or their neighbours threatening destructive war. Imperial marines sometimes take part in disaster relief, hostage rescue, and counter-terror operations. Naval Intelligence runs both overt and covert programs to monitor colonies for research and development of FTL transport or weapons of mass destruction. The Technology Transfer Assistance Service supplies technical information, the Economic and Social Engineering Advisory Services issue advice. The Independent Commission for Justice arrests and tries or extradites certain criminals and criminal facilitators. The Imperial Office is involved in continual diplomacy. The Secrete Service is supposed to do something, but it won't say what. Most colonials are very insular: they don't really notice what the Empire does on their worlds, have no idea of what it does on other worlds, and have only foggy notions of its relations to other things and the extent of its interests and powers. They learn of it mostly through video shows written by writers as ignorant as they are and from occasional brief and sensational items in the popular news, or from the propaganda of their own colonial governments. The Empire has no emperor. Chief executive authority and an executive veto on legislation belong to the Imperial Council, a board of directors/trustees that is self-perpetuating by co-optation. 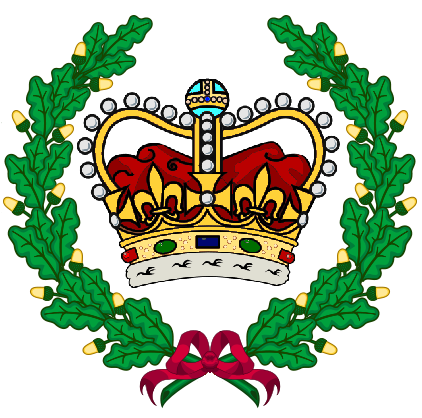 The Council elects one of its members to be chairman during its pleasure, and the Chairman of the Imperial Council is Imperial head of state and government "as representative of the Council". When the inaugural Senate selected symbols for the Empire — which it expected to be running — it considered an eagle to be the obvious choice but rejected it because an eagle had been a Mayflowerite symbol. Considering other attributes of the classical god Zeus/Jupiter it settled on an oak as symbol of the Empire as a corporate body. It also specified a stylised crown to be symbol of Imperial authority, and a crowned portcullis to be symbol of the Imperial Senate and the legislative power of the Empire. The crown as a symbol is not popular with Imperials, but they connect the oak with the name Eichberger. Oaks, oak leaves, acorns, oak wreaths, and sprays of oak as a common motif in Imperial uniforms, badges, unit crests, decorations, and regalia.